Study Spanish in Chile | Spanish courses in Latin America. There are many good reasons to choose to study Spanish in Chile. Chile is considered in many ways to be the most progressive country in Latin America, offering excellent modern amenities while still holding on to important aspects of Chile’s colonial and indigenous past, making this a fascinating country to visit. 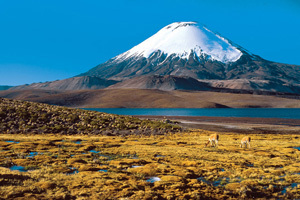 Chile also has some of the most incredible and varied scenery in Latin America. Our school, located in a quiet residential area of the capital – Santiago de Chile – attracts students from all over the world and offers a wide range of Spanish language courses. The school also organises work placement for students in local companies. This work placement must be preceded by a Spanish course at our school of at least 4 weeks. Our school in Santiago de Chile has 13 classrooms, a library, TV room, student common room and patio. Most of the Spanish courses take place in the mornings. A wide range of optional activities and excursions are offered by our school, as part of a cultural program, to help students see more of Chile and come to a better understanding of Chilean culture, lifestyle and the Chilean people. This cultural programme includes weekend excursions to the Pacific Coast for sun and seafood, white-water rafting on the Maipu River, and skiing or Snowboarding in the Andes – on peaks towering up to 17,000 feet and visible from Santiago. There are also vineyard tours, dinners with teachers and Salsa classes. Students attending Spanish courses at our school in Chile can choose to stay in carefully selected host families, or in self-catering apartments shared with other international students, or else with local young professionals. Students staying with families naturally benefit from speaking Spanish to their host family, but sharing a self-catering apartment with other students is also very enjoyable! Fly to Santiago de Chile. Free airport transfers for students staying in host families.